These are projects that I've currently been working on at Free People. 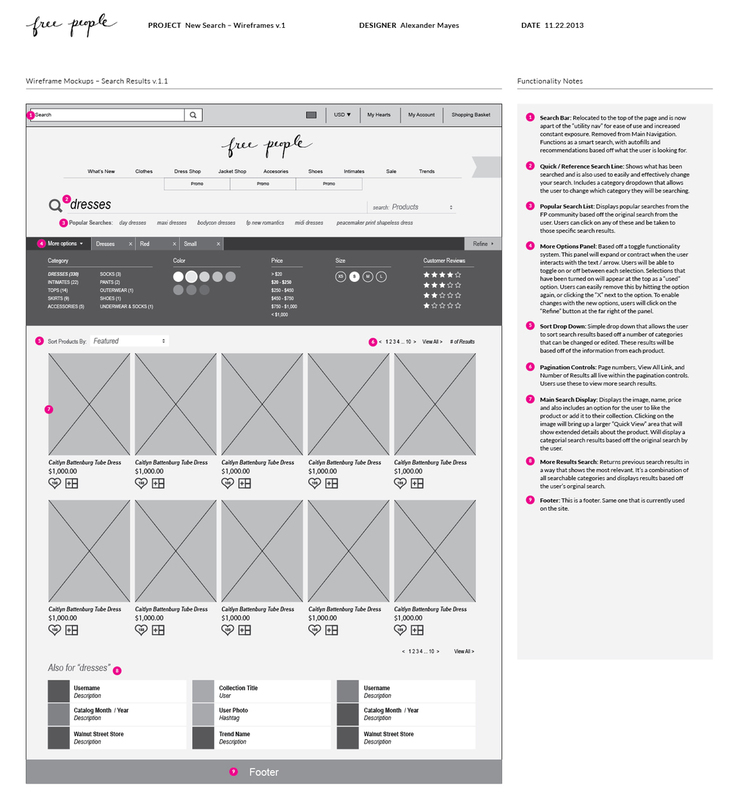 They are all at different stages of development, but capture a great look into my process and how I approach a design problem. 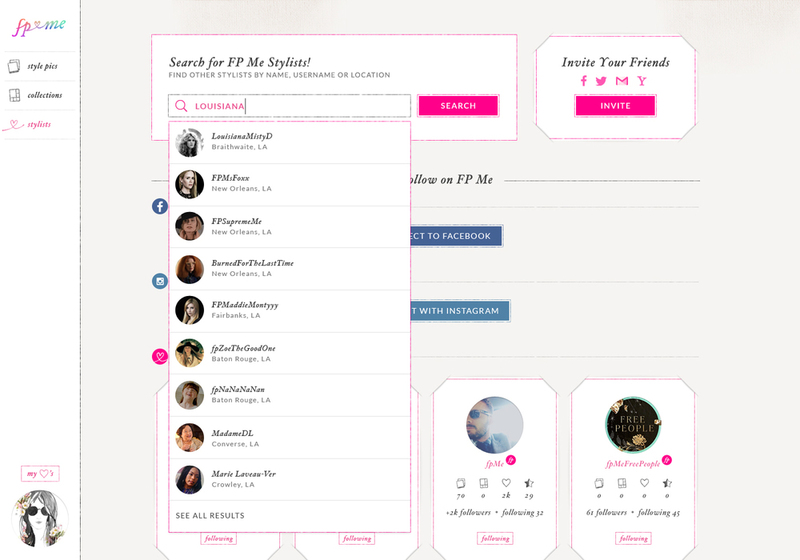 Users are unable to search for FP Me (Free People's Social Platform) content any where on the site. Customers find it difficult to find another user and they also have a hard time directly correlating products to FP Me content. Design an experience that allows them to surface this content, but not take away from the original product search. Users need a way to be able to discover other users and connect within FP Me. The current experience is limiting and confusing. The lack of an intuitive experience is hindering the user's ability to search, find, and follow another user directly in FP Me. 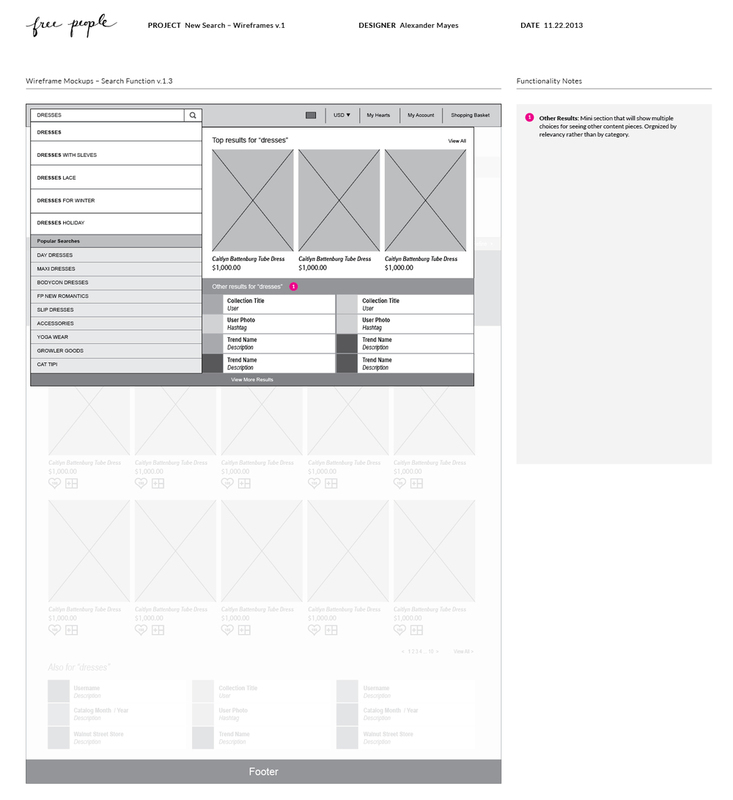 Design an experience where a user has the tools necessary to be able to search, find, and follow other users. 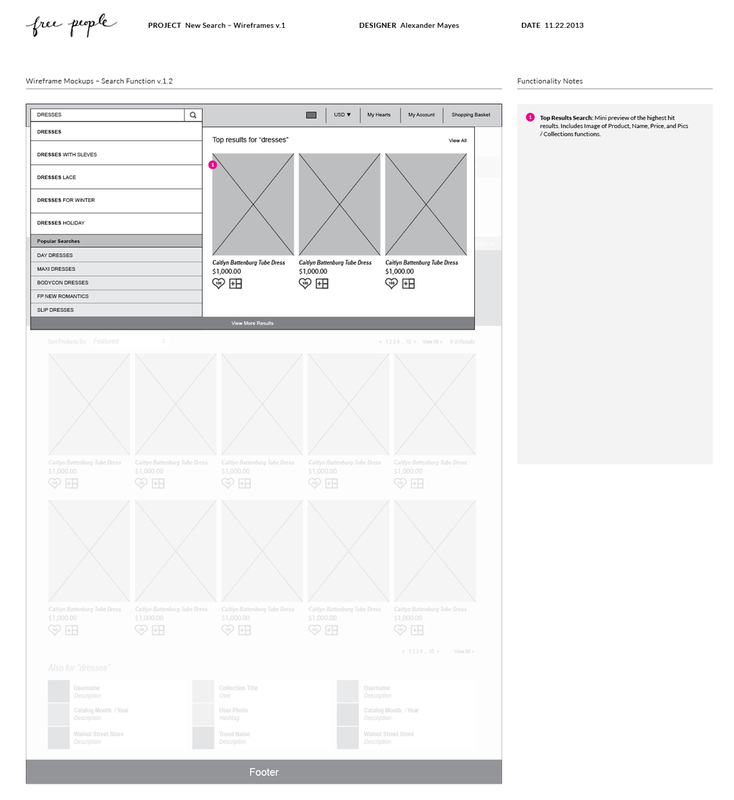 Condense pages and create a "stylists" section where users can complete all of these tasks. Also, create a profile page where users can view other's information more efficiently in a uniform manner. Free People users do not have a place on the global site to view our catalog videos. The current video page is just for one series (Roshambo) that doesn't feature any others. Users can not access any other Free People videos without visiting YouTube. Design a video gallery page that will allow users to cinematically watch any Free People video in a playlist type fashion. They will be able to choose from a wide range of videos and play them instantly at any time they choose. This will introduce a new line called "Free People Video". This was a design project I did when interviewing with Google. When I received the three design prompts from Google I was super excited that there was a time travel app option! I immediately chose this as my design exercise. I decided to go with this particular project because I think that time travel isn't far off from being readily accessible to anyone and that it would have a massive impact on our entire civilization. And of course, it helped that Back To The Future is probably my all time favorite movie! After I received the test, I immediately watched the entire trilogy and started to brainstorm. I wanted to create a modern and clean design, so that it could be easily understood, viewed on multiple platforms, and make sense even in different time eras. 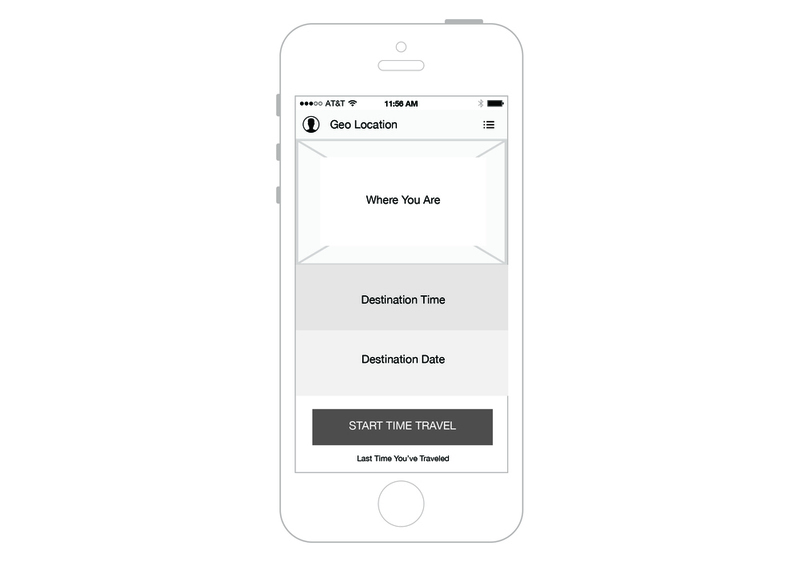 Making it aesthetically timeless was very important and key to the visual design of this app. Below are my initial sketches, ideas, and research. As with any project, I ask a lot of questions to get as much information as I can about the topic I'm designing into. Some of my UX questions were “How can I make the interaction of time travel quick and easy?” and “What tools in the app are absolutely necessary for traveling through different eras and which are not?”. 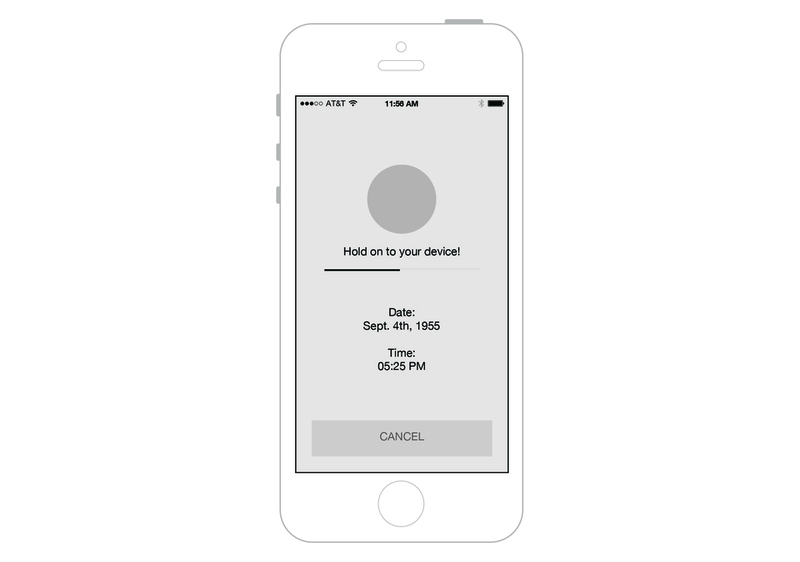 These continued to come up because I wanted to create an app that would be safe for users (time traveling can be dangerous!) and create an overall great experience. I wanted to make it quick and easy, because in the case of an accidental time travel that put them in harms way, the user would be able to quickly escape danger. This required me to make the UI simple and easy to adjust and use. 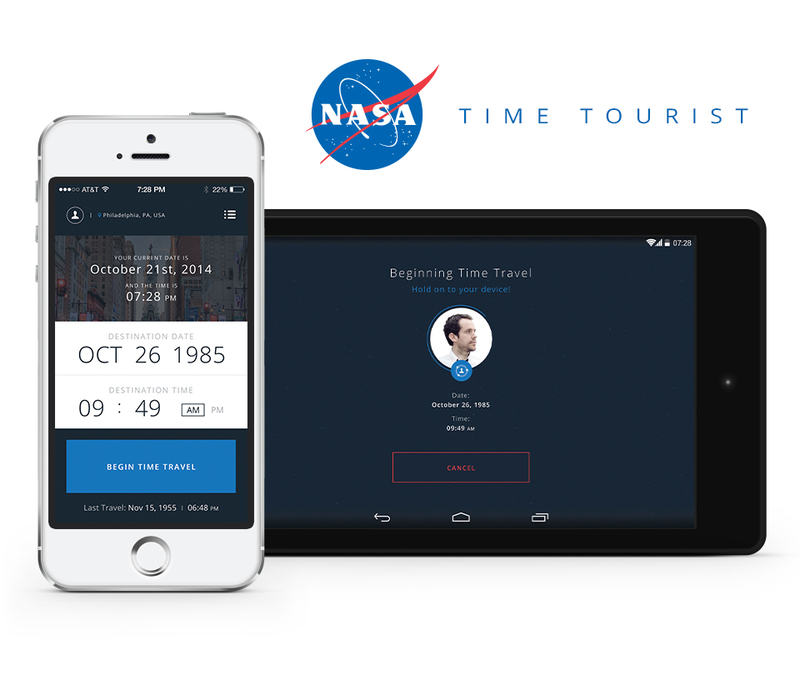 Being strictly a time travel app, the flow needed to be short and straight forward to give the user a clear path and for them to focus on the task at hand – time traveling. Since it’s an app by NASA, I wanted to give a nod to their base color palette, which led me to take inspiration from their insignia logo. I also pulled from a collection of space photos I found at a vintage store here in Philadelphia. I used a subtle dust and scratches pattern, that gave a slight texture to the dark blue background simulating a starry sky. A mixture of analogues and monochromatic colors created a cool and sleek background. This allowed me to use white and baby blue for contrast, when I wanted to expose actionable items like buttons or editable content. The typeface is Open Sans. I specifically chose this typeface because it’s modern, yet has a classic feel that relates to a dense san-serif, like Helvetica. It’s a bit on the playful side, along with being futuristic which is done by it having the option for it to be narrow and / or light. 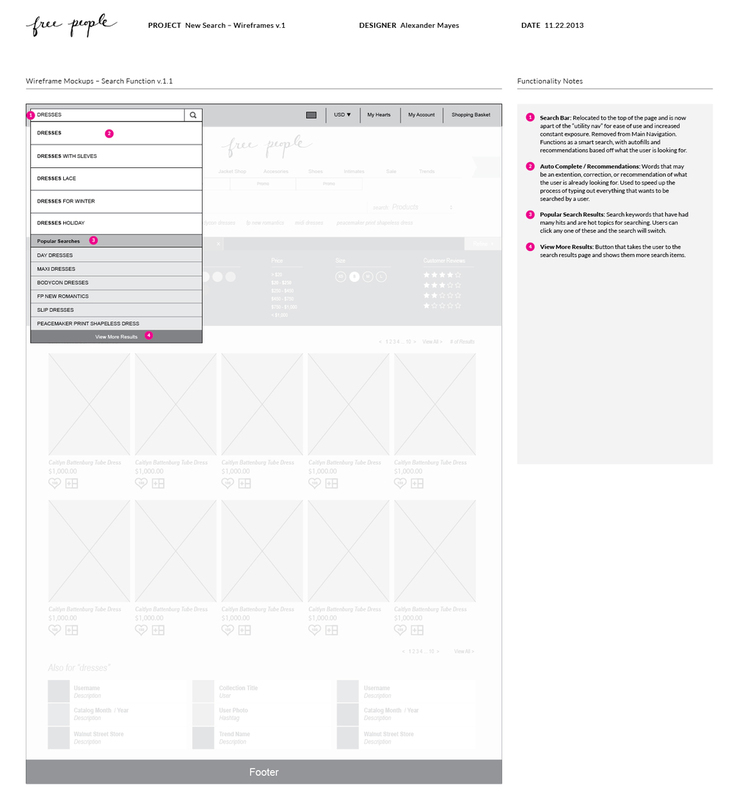 I wanted to design a UI with a great sense of eye direction and could let the user focus on what they are doing – without being intrusive or bothersome. Allows users the ability to connect via Facebook and Google+. 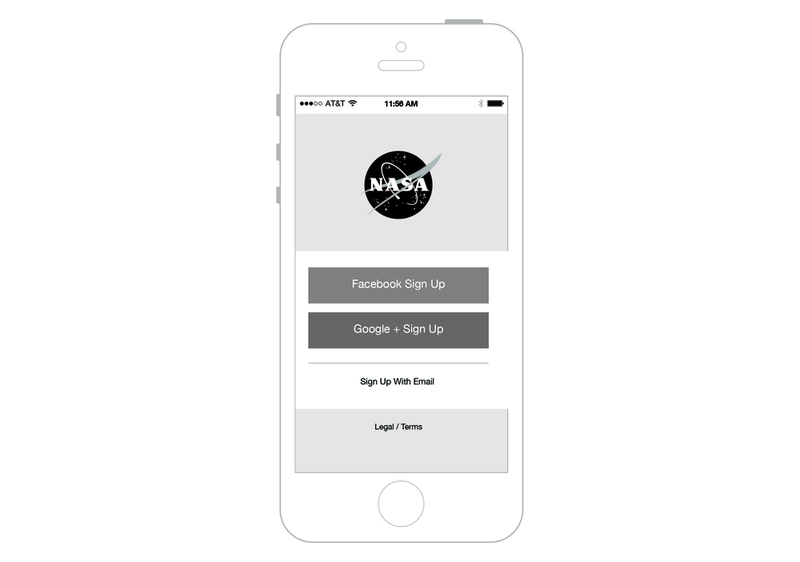 Along with being able to manually sign up with your email. Connecting, especially Google+, would allow for more location tagging, but instead of geolocation it could be something like "temporal location". This UI had to be simple, but provide all of the necessary information. Showing where the user was, interactive items allowing them to edit where they wanted to go, and an initiation button to start time traveling was key. Under the top nav is an area that will give you a background photo of where you currently are – this is based off the geolocation in the top left. Over the image, it will show the date and time of your current location. Below that, I chose to add contrast to the editable time travel items. If you tap on one of the items, it will expand over the top image and allow the user to focus directly on entering in a time or date. At the bottom is a button to begin time traveling. It's a bright color to make it to stand out for the user at the end – so they know exactly what they're doing. 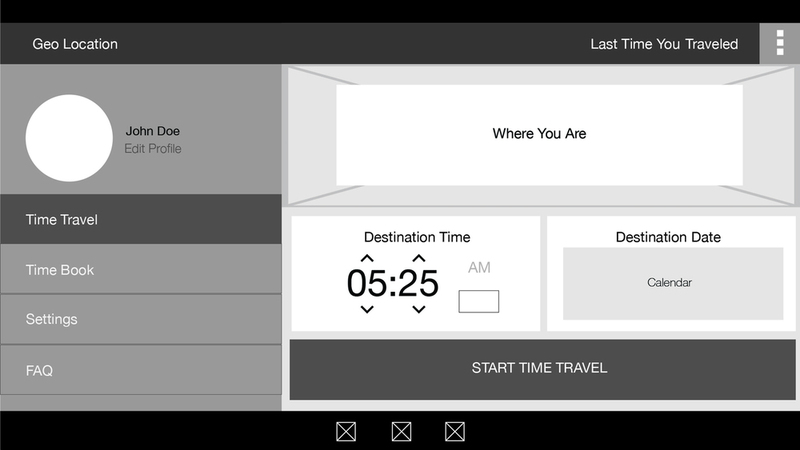 A simple screen at the end of the time travel interaction that reminds you to hold on to your device (you kind of need that), allows you to view the time left until you start to travel, shows you the date and time to where you’re traveling, and an "abort mission" option! Essentially, it’s a confirmation screen – giving you all the details that you've just entered and putting those details into action. 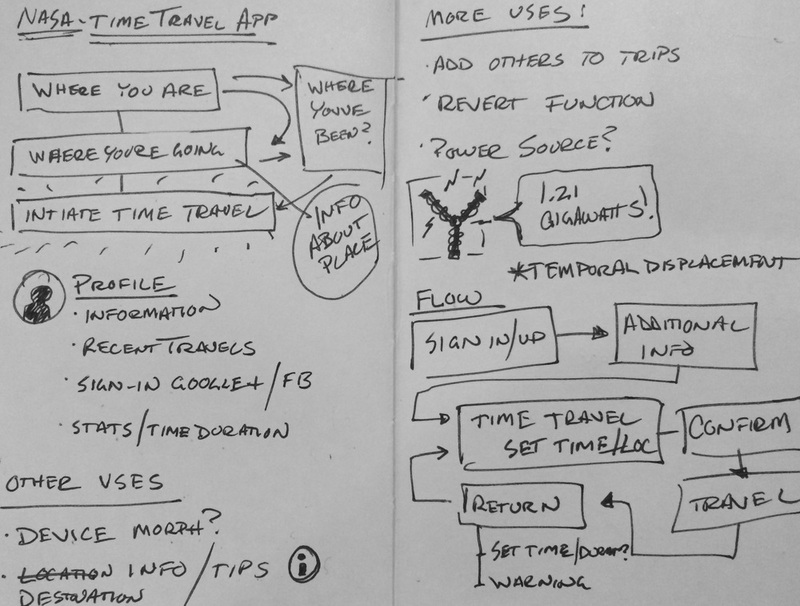 I wanted the user to be able to have their own settings, configurations, and security when it came to time traveling. I was playing with other ideas that could be implemented as well. Some of these were options for a device morph, finger print scan, and a portable satellite that the user could carry around and use as a WiFi signal. Allowing for connectivity throughout all eras!. A slide out menu is used to expose your profile and all of the extra nav items. Making them accessible, but keeping them more organized. The "Time Traveling" navigation item is purposefully second. It's an extra security feature. My thought behind that was – if someone (like your newborn baby) gets ahold of your phone – you wouldn't want your poor little baby to accidentally get transported into the middle of the Civil War! Same rule applies for when it's in your pocket. Say no to "pocket time-traveling"
Just like with the iOS device, the Nexus 7 will allow users the ability to connect via Facebook and Google+. 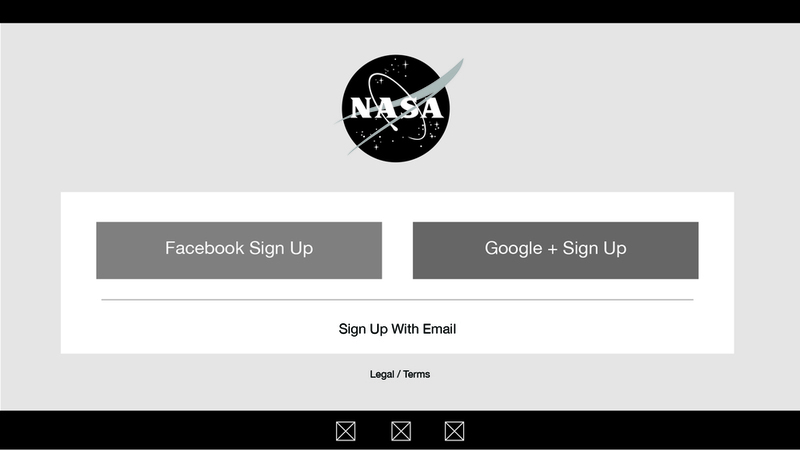 Along with being able to manually sign up with your email. For the Android UI the same rule applied. For the sake of preventing danger, it had to be simple, but still provide all of the necessary information. This shows all the exact same information as the iOS app, but on one screen. Allowing you to access all of the information at any time. 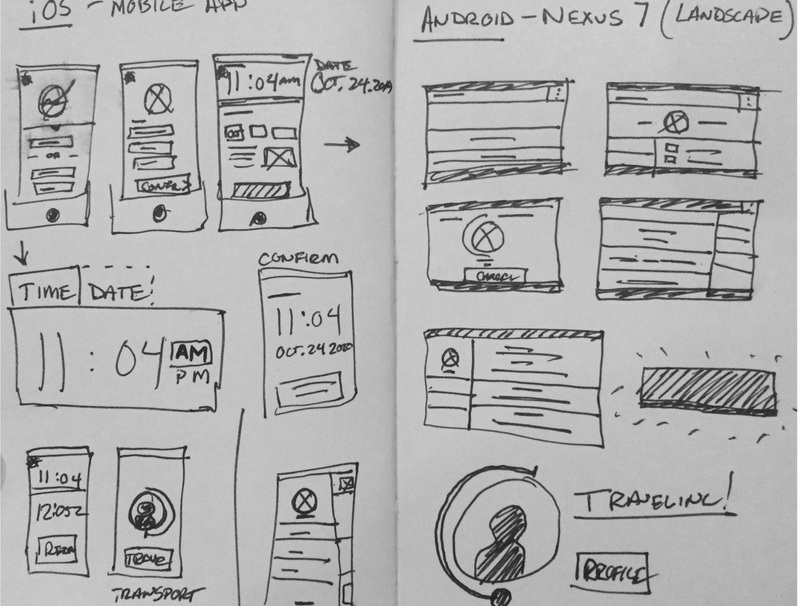 I had to be strategic with designing for the Android OS. 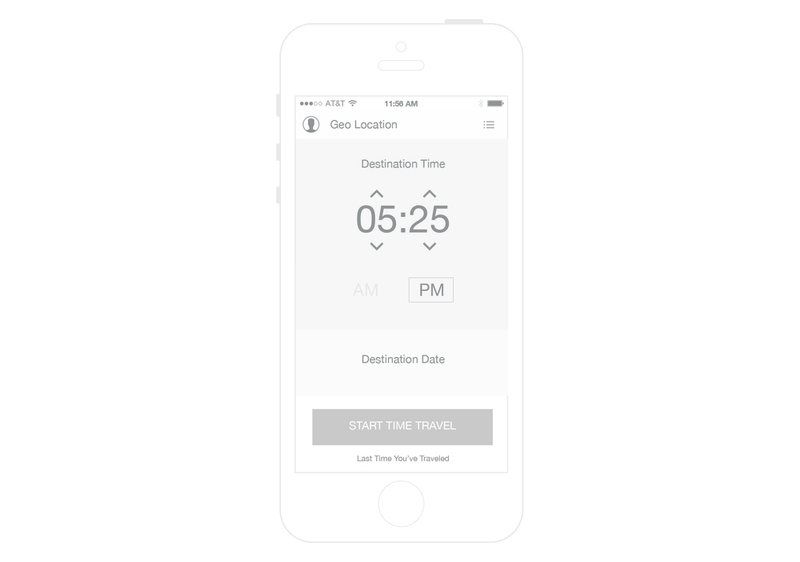 Making it so that the user isn't at all tempted to tap any of the navigation items during time travel. Concoction was a concept for an interactive web experience that would in the form of a restaurant. This project was created for one of my final senior design classes. The basis around the entire brand was to instill excitement and to tell a story through visual / interactive experiences. Each customer would order from their interactive application in store or for delivery on the website. They would create an account and that account would remember all the choices that you’ve made. 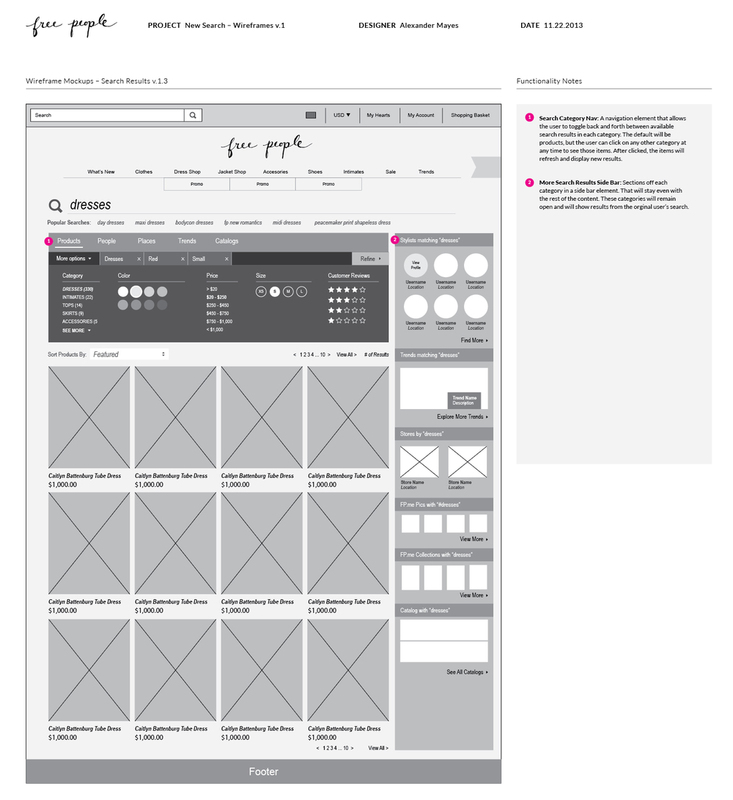 This would allow the user to have a feeling of remembrance and connectedness to the brand every time the visited. It could also recommend things that you may like and tell you about new things that are in the works. This way, you’re happy all together. You have more free time to worry about who’s joining you for lunch rather than what you’re having. Christopher La Rose is basically a genius. Well in the hydroponic farming world he is. Hydroponic Research is a culmination of all his hard work and him bringing his vision for an awesome web experience to me. He had an awesome story about how he got started from the ground floor and had started to build his company up from there. I wanted to capture that essence of a story within his brand and propel that onto the web. This web experience was highly centered around his story, but still giving his product a platform to sell on in the eCommerce world.